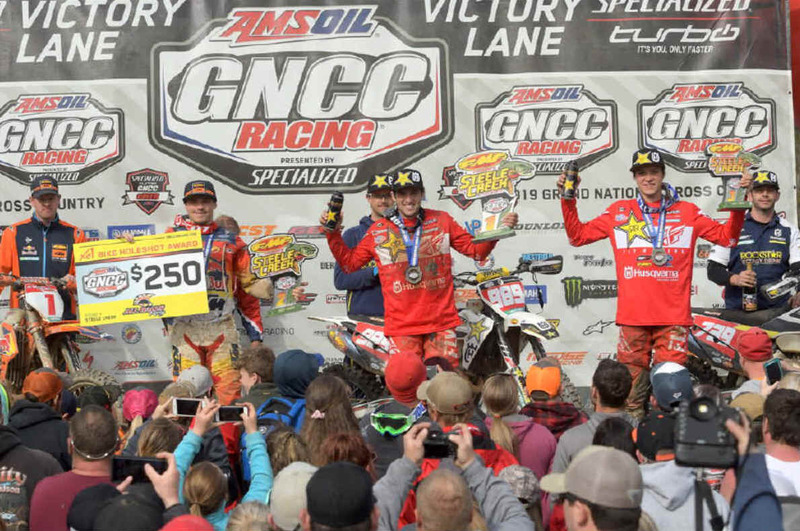 As round three of the 2019 AMSOIL Grand National Cross Country (GNCC) Series presented by Specialized, an AMA National Championship, came to a conclusion on Sunday, March 31, 2019 it was Rockstar Energy/ Factory Husqvarna Racing's Thad Duvall taking the 20th Annual FMF Steele Creek GNCC victory. As the green flag waved, it was FMF/KTM Factory Racing's Kailub Russell grabbing the $250 All Balls Racing holeshot award, and leading the group of XC1 Open Pro riders into the woods of North Carolina. Russell would hold onto a 2.68 second lead over Duvall and Rockstar Energy/Factory Husqvarna Racing's Trevor Bollinger. Kailub Russell started off the day by earning the $250 All Balls Racing Holeshot Award. Duvall would battle throughout the day with Russell and Bollinger, going from first to third multiple times. As the race wore one, Duvall made a last lap push to the front of the pack after witnessing Russell stuck in a rut behind lapped riders. With only miles to go Duvall and Russell engaged in a heated battle, but as the checkered flag flew it was Duvall coming through first, just two seconds ahead of Russell. Morganton's own, Bollinger found himself off to a good start coming through in the third place position. Bollinger would close in on the front two, even pass Duvall for second and set his sights on Russell. However, he would falter on the uphill twice which would cost him momentum heading into the last half of the race. Bollinger finished third overall, his second best finish of the season thus far. Thad Duvall captured his first 2019 season victory after an intense day of battling. Tely Energy Racing KTM's Steward Baylor Jr. found himself in the number four spot after battling throughout the day with fellow XC1 Open Pro competitors. With a win at the opening round and a pair of fourth overall finishes, Baylor Jr. sits third in the points standings as the series heads to his home state of South Carolina in two weeks. 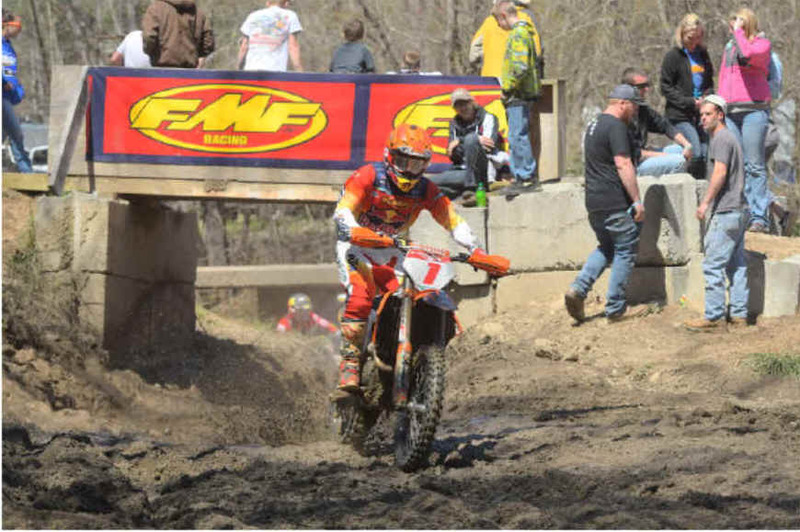 XC1 Open Pro rookie and FMF/KTM Factory Racing's Josh Toth is making moves in the right direction after earning fifth overall, his best overall finish of the season. Toth would run in fourth around the halfway point, but after suffering from a couple different issues he would settle into his top five finishing position for the remaining part of the race. 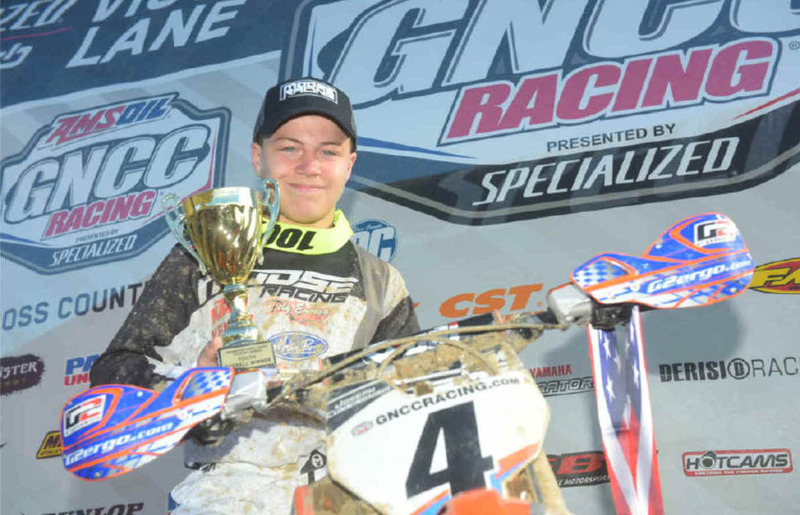 Kailub Russell came through second overall at the 20th Annual FMF Steele Creek GNCC. Babbitt's Online/ Monster Energy/ Kawasaki's Jordan Ashburn and Josh Strang finished the day out in the sixth and seventh place positions in XC1, seventh and eighth overall. Ashburn would come around in fourth at the beginning of the race, running there until about the halfway point when he would engage in a battle with Toth and his teammate. Strang, who calls North Carolina home in the United States, had a consistent day of running seventh before swapping positions a couple of times with his teammate Ashburn. This weekend AmPro Yamaha's Cory Buttrick showed improvements, coming through eighth in the XC1 class. Phoenix Honda Racing's Andrew Delong finished just inside of the top 10, with a ninth in his class. Unfortunately, FXR/Husqvarna/SRT/Hoosier's Layne Michael's return to the series was not as great has he had hoped for. After only completing one lap Michael would be forced to end his day from ripping stitches on his arm open. Ben Kelley earned his third consecutive XC2 250 Pro class win. Trail Jesters KTM's Ben Kelley grabbed the $100 Hot Cams XC2 holeshot award, and never looked back. Kelley would hold onto the lead, gapping the field by four minutes. As the three-hour race came to a conclusion, Kelley would take his third consecutive XC2 250 Pro class win of the season. After starting mid-pack, Trail Jesters KTM/MCS Racing/SSR Rider Development's Johnathan Girroir would work his way up to finishing second in XC2, his third-straight podium finish of the season. Girroir would also find himself inside the top 10 overall with a ninth place. Beta USA Factory Racing's Mike Witkowski was running second for the first three laps of the race, before battling with Girroir. Witkowski would hold onto his second podium finish of the season with a third in the XC2 250 Pro class. Cody Barnes (center), Jesse Ansley (left) and Jason Thomas (right) rounded out the FMF XC3 125 Pro-Am class. As the FMF XC3 125 Pro-Am class left the starting line it was Highland Temp Works/Offroad Riding Schools/Maxxis' Jason Thomas earning the $100 Wiseco FMF XC3 class holeshot award. Thomas would begin to try and place a gap on the rest of the 125cc class group, but Beta USA Factory Racing's Cody Barnes was right behind him. Barnes would be able to make the pass for the lead one on the fifth lap, then put his head down and ride to his second consecutive FMF XC3 class win of the season. Trail Jesters KTM's Jesse Ansley was running in the final podium position for the majority of the day, however, as the white flag came out he would make the pass on Thomas for second in his class. Thomas would hold onto third, taking the last podium position of the day in the FMF XC3 class. 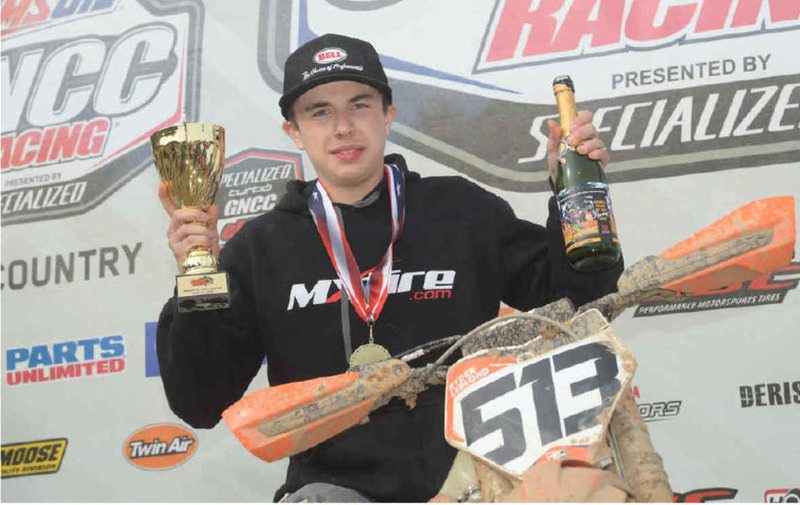 250 A rider, Ryder Leblond, came through 23rd overall earning the FMF Steele Creek Top Amateur award and his class win. Evan Earl came through 24th overall, earning the Open A win as well, followed by Nicholas Kordana in 27th overall and second in the 250 A class. 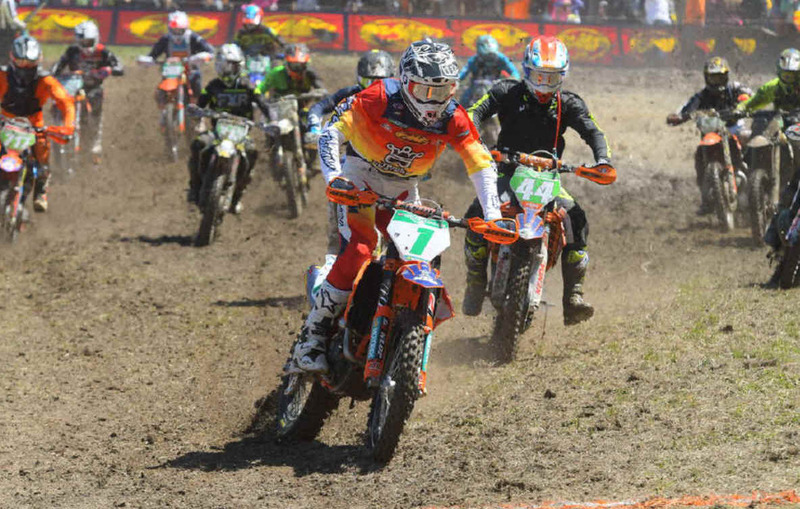 Ryder Leblond took home the Top Amateur honors after finishing 23rd overall and earning the 250 A class win. Rockstar/Husqvarna/Moose Racing/Shaw Wines' Tayla Jones came through as the overall winner at the conclusion of the 10 a.m. race in North Carolina. Following Jones was Fly/Maxxis/Pro Circuit/KTM's Becca Jones coming through in second after running there for the duration of the race. KTM/MEPMX/Fly Racing's Mackenzie Tricker rounded out the WXC podium for round three. Joseph Cunningham is on a winning streak, finishing first overall for the third-straight time and taking the YXC1 Super Mini Sr. (14-15) class win. 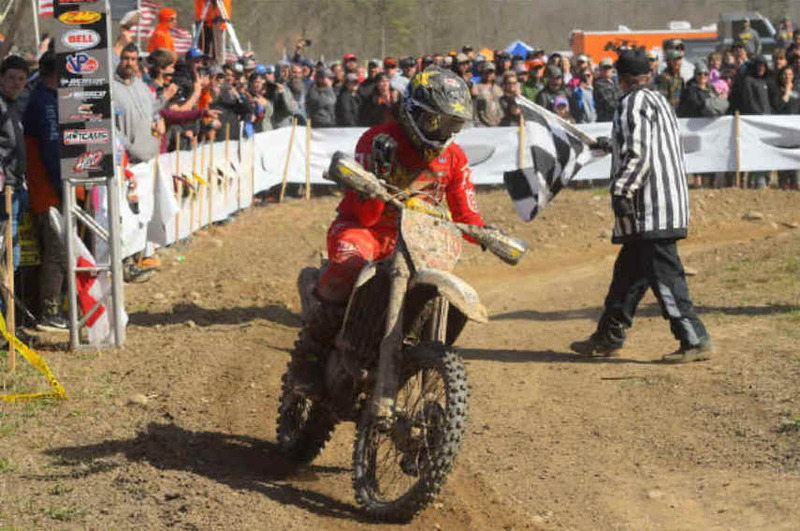 West Virginia's Canon Kuneff came through second overall, and his the YXC1 class, with Kawasaki's Grant Davis rounding out the overall podium. Davis would also take the YXC2 Super Mini Jr. (12-13) class win. Morganton's hometown heroes, Colton Shields finished third in the 85cc (7-11) class, Noah Cooper finished eighth in the 85cc (12-13) class, Maddox Moretz earned 10th in the 65cc (7-9) class. Joseph Cunningham came away with his third-straight youth overall win. North Carolina State Treasurer, Dale Folwell was the 2019 FMF Steele Creek Grand Marshall. Dale competes in the Golden Masters B/C (60+) class, and is an avid motorcycle enthusiast. 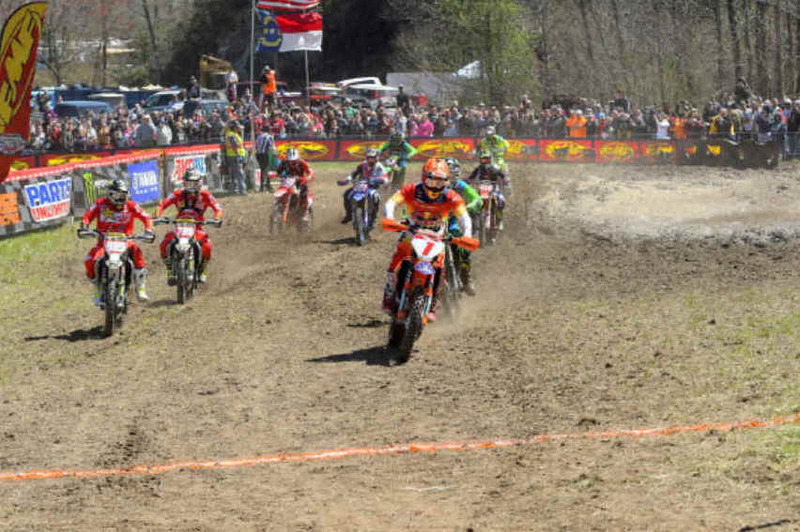 After racing in the 10 a.m. race, where he finished third in his class, Dale accompanied GNCC Racing's Rodney Tomblin on the 1 p.m. starting line and gave out the infamous "TEN SECONDS" call as the XC2 250 Pro class took off. The 1 p.m. bike pro race was broadcast LIVE in its entirety on RacerTV.com and can be viewed as archived video online by visiting the GNCC LIVE page online. A highlight show featuring the event will be aired on the NBC Sports Network on Saturday, June 15 at 2:30 p.m. EST. 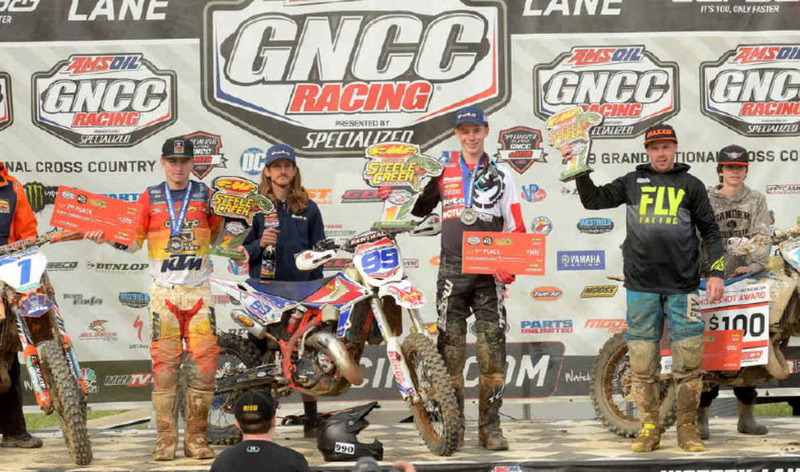 The 2019 top three Steele Creek GNCC overall finishers were: Thad Duvall (center), Kailub Russell (left) and Trevor Bollinger (right). The 2019 top three Steele Creek GNCC overall finishers were: Thad Duvall (center), Kailub Russell (left) and Trevor Bollinger (right). The 2019 GNCC Series returns in two weeks, April 13-14, with the CST Tires Camp Coker Bullet in Society Hill, South Carolina. This event will host a handful of special events throughout the weekend for everyone in the family. Be sure to keep an eye on the event page for up-to-date times and events.